Location: Astera Hotel & Casino is located in the central part of Golden Sands resort on the main seaside lane, 20 m from the beach. Accommodation: The hotel offers 175 double rooms, 28 luxury double rooms and 2 one-bedroom suites. Contemporary designed rooms are provided with armchair, mini-bar, SAT TV, telephone, air conditioning, electronic lock system, bathroom with shower, bathtub, telephone and hairdryer, laundry-dryer stand and spacious terrace with a panoramic view to the Black Sea. 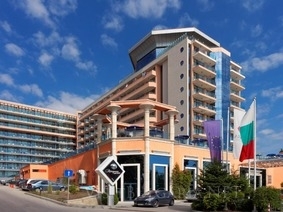 Hotel facilities: Number of storeys - 9, Elevator - 2, Safe at the reception (Ђ), Animation programmes, Wi-Fi (at the reception and in the lobby bar), Сredit cards (Visa, MasterCard), Currency exchange, Rent-a-car, Parking (free of charge), Secured area. For children: Children's entertaining programs, Children's pool, Ваbysitter (on request, Ђ), Baby cot (free of charge), Children's carriage rent (free of charge), Children's room. Wine & Dine: "Arrogance" restaurant offers quiet and snug atmosphere. The menu includes delicacy dishes of the European and the national cuisine. The team of "Mon Ami" restaurant invites you on a delicious culinary trip in a unique atmosphere full of discrete luxury. The restaurant is exceptionally suitable for private еvents, business meetings, as well as for a romantic dinner. "Silver Gourmet" is a boutique restaurant for connoisseurs with capacity of 40 seats. The interior in the stylish premises is designed in silver and white with red accents. "Astera" Lobby bar offers variety of drinks, cocktails and homemade sweetmeats in a relaxing and calm atmosphere for friends' dates and recreation. Situated on an incredible terrace with a excellent view to the Sea, just next to the outside swimming pool of the hotel, "Belle View" restaurant will fascinate you with the unique taste of fresh salads, light breakfasts, stunning drinks and cocktails. The fresh splashes of a small fountain and the puff of the Sea breeze will create for you a pleasant atmosphere in the hot summer days. The night club offers 4 halls with different types of music. SPA centre: The Wellness & SPA Centre of Astera hotel is a modern place, offering a large variety of procedures, massages, therapies and programs for weight loss, detoxication, revitalizing, tonus and relax of the body and mind. It proposes the best SPA cosmetics brands as Pevonia Botanica, Thal'ion, Kneipp и Rior. At you disposal are: outdoor swimming pool (235 sq.m), indoor swimming pool 32 °C (145 sq.m), steam bath, sauna, fitness, solarium, massages, Jacuzzi. Conference facilities: The hotel offers 2 equipped conference halls (30 pax and 100 pax).